Sweaty hands, sweaty feet, too much sweat underarms? Hyperhidrosis (excessive sweating) is a clinical condition where parts of the body (underarms, hands, feet, back, face, between toes, etc) are sweating more than the body requires to sweat.If you sweat a lot, and it is blocking your social activity, try Drysol. Drysol dries sweaty areas effectively. Drysol works in 80% people who tried Drysol products for excessive sweating. Hyperhidrosis (excessive sweating) is commonly an inherited condition and Hyperhidrosis (excessive sweating) can affect those who suffer from Hyperhidrosis (excessive sweating) on a social, functional, and emotional level. Try Drysol. Drysol is your solution! Drysol Extra Strength Liquid 37.5ml, Drysol Extra Strength Dab-On Type 35ml (Dab-O-Matic) Drysol Mild 35ml(For sensitive areas) great discounts! BuyDrysol.com is the discount store for excessive sweat control needs. If you experiense excessive sweat - sweat crazy - then BuyDrysol.com is your answer! BuyDrysol.com now has a special discounted prices on Drysol Extra Strength, Drysol Mild, and Drysol Dab-On. BuyDrysol.com also offers Certain-Dri Roll-On 35.5ml as well as other anti-fungal medicine cream for athlete's foot & jock itch. Hyperhidrosis (excessive sweating) is a clinical condition where parts of the body (underarms, hands, feet, back, face, between toes, etc) are sweating more than the body requires. It is commonly an inherited condition and can affect those who suffer from it on a social, functional, and emotional level. But your dark days are over! Drysol is reported to work in 80 percent of the people who use it for excessive sweating. Doctors generally recommend applying it to problem areas after drying the skin completely. Wearing it only at bedtime and then washing it off in the morning with plain water reduces the chance of skin irritation. Generally, treatment is repeated nightly until sweating is under control. This may happen after just two or more treatments. Thereafter, you can apply Drysol once or twice weekly or as needed. 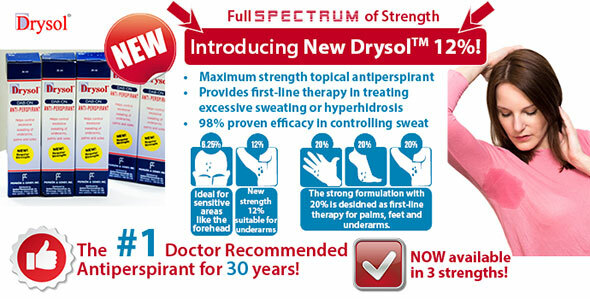 Drysol Extra Strength Liquid is an antiperspirant used to treat excess perspiration problems. This works in the toughest cases. *This product is back ordered. Please see farther down for products currently in stock. Drysol Dab-On is an antiperspirant used to treat excess perspiration problems. This works in the toughest cases. A mild form of Drysol in a solution of Aluminum Chloride in Anhydrous Ethyl Alcohol. Due to its lower concentration, it is especially suited for the face, back, and toes and is also excellent in maintenance therapy.